2 Days in Newcastle — Journal by jysla kay. Travelling abroad during the Christmas and New Year period can be expensive and stressful, which is why 'staycations' at the beginning of each year can be a great alternative. Unless you've planned and booked well in advance, international flights during the holiday season can get really expensive. Which is why we always end up booking a last minute Airbnb a few hours drive away. Like an unplanned, unofficial tradition, Kevin and I have always found ourselves on a staycation at the beginning of each year somewhere alongside the coast. Being near the water, or anywhere where we're surrounded by nature, helps us recharge and unwind (and also gets us active again after doing practically nothing but eating and drinking for the past 2 weeks). We have never been to Newcastle before, despite it only being a 2.5 hour drive away, and we weren't expecting to do much besides lying on the beach for 2 days. We didn't expect there to be such a different vibe in Newcastle — everyone was so friendly and relaxed, there's an genuine love for food, coffee and craft beer, and it seemed like every street was lined with quaint and colourful buildings. There was something authentic and unpretentious about Newcastle that we fell in love with right away. Most people would probably visit Fort Scratchley for the history, but the views are pretty spectacular too. We went twice: once when it was closed (Tuesday), and again when it opened the next day. It seems silly to go when it was closed, especially when most of the area is closed but we knew it would be practically empty—and fun to explore and take photos without anyone else around. A quick Google search on "things to do in Newcastle" returned the usual, popular places like Nobby's Lighthouse, Newcastle Memorial Walk and Fort Scratchley but surprisingly (in retrospect), there was no mention of King Edward Park. Despite not knowing where we were or where we were going, we didn't rely too heavily on Google Maps because we were happily dazed with our calm surroundings and were quite content with exploring at our own pace (AKA we were lost but we were cool about it, and when I say we, I mean my control-freak-perfectionist-tendencies was kept at bay for the time being). 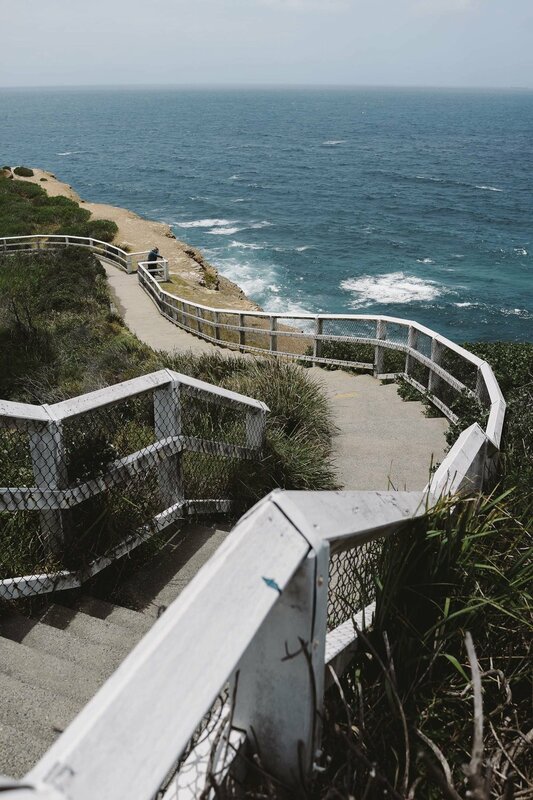 King Edward Park is a large park, so it's hard to miss, with incredible ocean views. Entry and parking were both free, with plentiful of the latter, which blew our minds (because, Sydney). Driving through the park, we caught a glimpse of an interesting walking path that we returned to explore the following day. We parked at the end of The Terrace and made our way down the path, which is a small section of Bathers Way. The track passes the remains of an interesting defensive fort, and winds down towards a swimming spot called Bogey Hole. Delicious, creamy gelato made by hand. That's really all you need to know. Did I mention it's delicious? The reviews of Nagisa were exceedingly positive and the pictures of the food online looked amazing so we were pretty excited to have dinner here. The prices are reasonable, the sashimi was fresh, the menu had great options and the drinks list was extensive but the service was a letdown. There were a few small incidents, for example, we were approached during our meal by a waiter who abruptly announced: "Excuse me, just letting you know that there's a booking at this table at 7pm [less than an hour away]," who then stood there expectantly without saying anything else. Taken aback, I glanced at the empty tables around us, before awkwardly laughing and telling him that we'll be done by then. I'm sure there was a better way he could have told us that—it felt like he was trying to hurry us along even though we had made a booking. If a restaurant is marketing itself as upscale and its prices are higher than the norm, then I'll expect the service to, at the very least, be polite and welcoming. I think it bothers me more when the service is unprofessional than when the food is bad. P.S. Book before you go — we were turned away from a 95% empty restaurant the night before because they were fully booked. Sushi Castle is a small, modest restaurant on the other side of the restaurants along the wharf but we actually had a much more memorable and positive experience here the night before Nagisa. We were greeted with a warm smile and were handed the menu in a plastic sleeve folder. Surprisingly, the sashimi was pretty good and the udon was a generous serving. Food and drinks were so affordable and the waiter delivered the food with such care and respect. I see Baja fish tacos on the menu and I'm sold — I'm easy like that. The filling was delicious but the house made corn tortilla was too thick and dry for my taste (I definitely prefer the softer, thinner and probably-less-healthy tortillas). Definitely one of the coolest food joints I have ever been to! I probably spent half the time admiring the place, and the other half trying to avoid eye contact with the people sitting across from me. The ramen and gyoza was tasty enough but it was unfortunately on the blander side. I think the place is still worth a visit though, even if just for the experience. We stayed in an Airbnb which was central to everywhere we wanted to go, included breakfast and a secure parking spot. See my previous post for more photos and details!